For the first time, it seems that I’m reading a series backward. Of course, it was also written a bit backward, which explains why I’m going about it this way. While Pebble in the Sky was the first book in this series, it actually comes at the end of the narrative. A year later, Isaac Asimov would write the prequel, The Stars, Like Dust, which was then followed by a book that fit between the two. The Currents of Space is that book. Fortunately, there isn’t much tying this book to Pebble in the Sky, other than the universal setting for the events to take place. It is encouraging that Asimov’s writing was able to improve in two short years between his first ever novel and this follow-on prequel. The Currents of Space has a distinct main character, apparent conflict, and well-timed plot revelations. The focus of this book helps to describe a somewhat interesting and thrilling scenario, even if it’s peppered with lots of clichés that are still present to this day. The “amnesiac expert” is by no means a new or unique storytelling device by today’s standards, but it may have been interesting back in the 1950’s. Despite the improvement in Asimov’s writing, there were still a few choices that I felt were perhaps due to the weaknesses in Pebble in the Sky. In his first book, it was difficult to grasp everything that was happening. 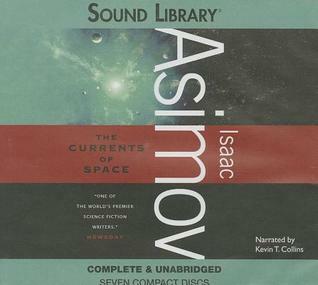 In The Currents of Space, one of the characters does an exposition dump that amounts to a recap of the first two-thirds of the book. While there was some added info to this information that led to the satisfying conclusion of the plot, it still seemed unnecessary if the reader was paying attention up to that point. An improvement over his previous work in the series, I give The Currents of Space 3.0 stars out of 5.